One of the most popular of the more than a dozen cosmetic laser systems manufactured by Cynosure is the Cynosure Cynergy laser machine. Using Cynosure’s exclusive MultiPlex technology, the Cynergy can perform virtually any type of vascular treatment, including leg veins, facial veins and spider veins. With the available Cynosure PL module, you can add even more treatment options, such as rosacea and sun-damaged skin. You will have a hard time finding a more versatile cosmetic laser system, but you’ll have no problem at all finding a low price on a pre-owned Cynosure Cynergy laser machine at SunrayLaser.com. 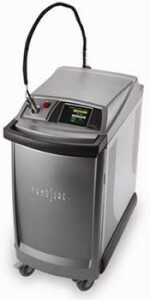 We carry a complete inventory of quality used cosmetic laser equipment, including the full line of Cynosure models. With two wavelengths and a list of patient-friendly features for maximum comfort, the Cynosure Cynergy laser system will help you treat patients faster while making their sessions more comfortable than ever. With the ability to perform so many cosmetic applications, you can offer another treatment option after a patient has their first pleasant experience with the Cynosure Cynergy. At SunrayLaser.com, we realize that the price of a used Cynosure Cynergy laser machine is probably the most important factor in your buying decision. But you should also consider our 100% satisfaction guarantee, our flexible financing options and friendly customer service. We think that all makes SunrayLaser.com the best place to buy Cynosure Cynergy laser equipment at the lowest price.